Hapuna Beach and Mauna Kea Beach are gorgeous white sand beaches pounded by the crystal blue Pacific ocean on the island of Hawaii. Visiting them may redefine your view of the perfect tropical beach. Both beaches are located on the Kohala coast, north of the Kona airport and Kohala resort area off Queen Ka'ahumanu Highway (Hwy 19). Hapuna beach is located at the 69 mile marker, just south of Kawaihae harbor, 30 miles north of Kona. The beach is a half a mile long, with crystal clear water and fine white sand. A path leads to the sand making access easy. Life guard stands watch over swimmers and post signs if there are dangerous currents or surf conditions. The surf can get violent since the beach is not protected by a break water. On weekends and holidays Hapuna beach can be very crowded and parking can be a challenge. The Hapuna Beach Prince hotel sits at the north end of the beach. The hotel has 350 rooms, 2 golf courses, a spa and pool, and health club. Kauna'oa or Mauna Kea Beach beach is a mile away from Hapuna beach at the 68 mile marker. The sand beach is in the shape of a crescent and over 1/4 mile long. Snorkeling and boogie boarding are excellent and the sand is wonderful. There is limited parking and the surf can be dangerous, like Hapuna beach. At night you can see a big light under the ocean which attracts plankton making it a popular destination for tour boats bringing snorkelers to see manta rays. The Mauna Kea Beach hotel, which sits right on the beach, was built by a Rockerfeller in 1965. The hotel has 310 rooms, pool, health club, tennis courts, golf courses, restaurants, and on-site luau. On weekends and holidays Hapuna Beach and Mauna Kea Beach can be very crowded due to their popularity with locals and visitors alike. Parking is limited, so get their early in the morning and stake out your perfect spot on the white sand. Since the Big Island of Hawaii is an active volcano, we were surprised at the lack of natural hot springs, like the many popular onsens in Japan. Ahalanui Park, on the east side of the Big Island in Puna, is one exception. This Hawaii County park has a huge naturally heated pond within a manmade wall, refreshed with ocean water. The water can get up to 90 degrees from the heat generated by the Volcano. Fresh ocean water helps keeps the water in the pond clean and the fish swimming underfoot makes it fun to snorkel. The bottom of the pond is sand and mud making the water often murky. The feeling of soaking in the warm water with the rush of the ocean nearby is wonderful and fun. All the visitors we have taken to the pond have enjoyed it immensely and were reluctant to leave. The park is free, open daily from 7AM-7PM, and has ample parking. The protective wall and life guards help make the pond safe for children and non-swimmers. Don’t try swimming in the ocean on the other side of the wall though, it is ferocious. Staircases help make the hot springs pond more accessible. A caution: the warm water can harbor bacteria, so don’t swim with open wounds or if your immunity is low. The park has portable toilets, picnic tables, BBQ grills, and shaded areas to relax and enjoy the view of the Pacific Ocean. Ahalanui Park was opened by the County of Hawaii in 1993 and is visited by a mix of tourists and locals. The Puna district is the size of Oahu and still very remote. Many of the roads in Puna have been destroyed by lava flows, limiting access to much of the Puna area to only one two-lane road, Highway 130. If you want to stay in the Puna district, search on-line for a B&B, Inn or vacation rental. The closest rentals near Ahalanui Park are in a residential area surrounding Kapoho Bay, about 2 miles down Hwy 137/Kapoho Kalapana Road. The nearest town is Pahoa, about 15 miles north from Ahalanui Park and about 20 miles south from Hilo Airport (ITO). Driving times are often extended by crowded and narrow roads. A drive from Pahoa to Ahalanui Park recently took us over 35 minutes. On the Big Island of Hawaii: From Highway 11, take Highway 130 south through Pahoa. The road changes name to Hwy 132/Kapoho Road. When it dead ends at Highway 137, turn right on Kapoho Kalapana Road. The Park is located on the left, just past Mile Marker #10 where the road narrows. There are several other beaches along Hwy 137, but beware, the strong currents and huge waves have drowned many a strong swimmer and seasoned local. Ahalanui Park is one of the few places where you can admire the fury of the Pacific Ocean while being protected by a man-made rock wall. Kilauea Volcano on the Island of Hawaii has been extremely active since last year. 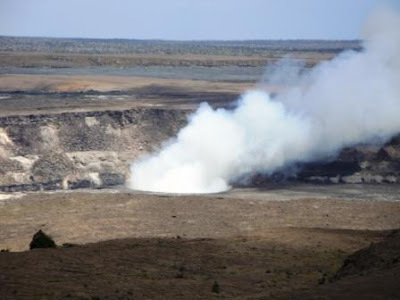 On March 19, 2008, Halema'uma'u crater on Kilauea had an explosion that generated a magnitude 3.7 earthquake and scattered rocks over a 75-acre area. A week later, the white gas from the vent in the crater turned brown-gray and lava particles were emitted. Another vent 15 miles from the Kilauea caldera towards Hilo, Pu’u O’o vent, began spewing gasses in earnest adding yet more gas and Vog (volcanic fog) over the islands of Hawaii. 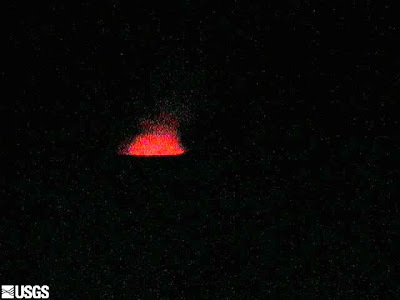 The picture above was taken from Jaggar Museum in Volcanoes National Park on April 11, 2008. The vent was putting out a lot of gas, but was small in circumference. Over the past year the Volcano has become increasingly active with lava flowing to the ocean, frequent earthquakes, and the Halema’uma’u vent glowing red from swirling lava coming closer to the surface. 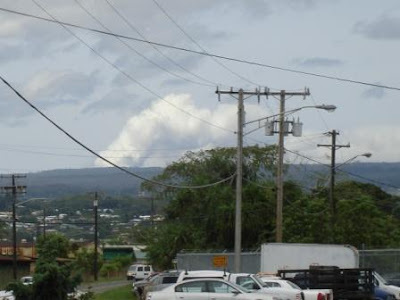 In August of last year we were able to see the Volcano’s gaseous plume all the way from Hilo. We regularly drive up from Hilo to Volcanoes National Park to check out the Halema’uma’u vent and witness the powerful presence of the Volcano. We have been greatly impressed by the output of white and gray gasses and the continued growth of the circumference of the vent. 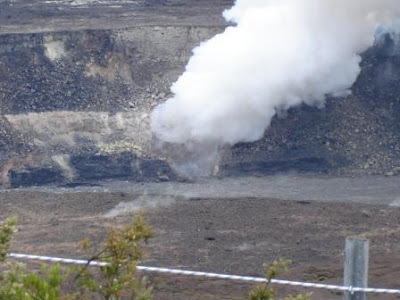 A picture of the crater taken from Jaggar Museum on June 27, 2009, shows the enlarged vent with heavy gaseous output. At that time, the vent glowed brightly at night. The past couple of weeks the volcano surprised us with its decrease in output. Here are some pictures from July 6, 2009. Starting July 4 the plume turned wispy and the sulfur dioxide emission rate was the lowest measured since the beginning of 2008 and comparable to the 2003-2007 average daily rates. Perhaps, the overwhelming Vog that we have been experiencing on the west side of the Big Island and along the Hawaiian Island chain will subside and the blue skies over Kona will return.